You may not think of fruit when you are trying to increase your iron intake. Some types of fruit are higher in iron than meat and will help you reach your daily intake recommendations, which is 18 mg for women and 8 mg for men, according to the U.S. Department of Agriculture. Iron is important because it makes hemoglobin in your red blood cells, which then moves oxygen throughout your body. It also prevents anemia. A serving of fresh peaches contains less than 1 mg of iron, but 10 dried peach halves contain 5.3 mg. Opting for dried fruit means you are getting more iron because a serving contains more fruit. Try adding dried peaches to your oatmeal to help prevent anemia, which occurs when your iron levels are low. Dried peaches are a better choice than pork, which contains less than 1 g of iron per 3-oz. serving. If you feel weak or tired much of the time, your doctor can perform a simple blood test to determine if your iron levels are less than optimal. If they are, increasing your intake of fruits that contain iron may help. Currants are a fruit that can be used in muffins or bread and a cup of raw currants contain nearly 2 mg of iron. Opt for dried currants and you will be getting almost 5 mg per cup. In comparison, 3 oz. of chicken contains only about 1 g of iron. A prune is a dried plum, which means you get more iron than from the fresh fruit. A cup of prunes contains about 4.5 mg of iron. Prunes can be eaten plain or added to trail mix or cereal for a boost of iron and fiber. Prune juice is also an option for increasing iron intake and an 8-oz. serving contains 3 mg, which is more than the amount found in 3 oz. of beef. Raisins are another dried fruit that contribute to your iron intake, with about 2 g per 2/3-cup serving. Made from grapes, they contain more than twice the iron per serving. Raisins are a good addition to cereal, trail mix, oatmeal and baked goods and doing so makes increasing your iron intake easy. 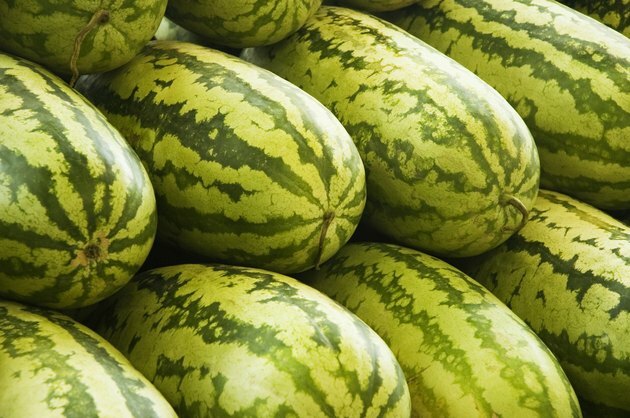 Watermelon is a fruit that contains iron without being dried. It is typically available year-round and can be easily incorporated into a well-balanced meal plan. One-eighth of a medium-sized watermelon contains about 1.5 g of iron. In comparison, 3 oz. of fish contain only about 1 g. Watermelon also contains vitamin C, which is a nutrient that helps your body more efficiently absorb the iron from your food.